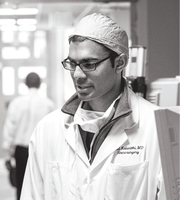 A Tribute to Paul Kalanithi, M.D. Lucy Kalanithi discusses her late husband's life and her experiences as a physician and caregiver with twin sister and Cup of Jo blogger Joanna Goddard. Lucy Kalanithi is an internal medicine physician at Stanford and associate fellowship director at Stanford's Clinical Excellence Research Center, where she leads innovative efforts to improve healthcare value. She completed her MD at the Yale School of Medicine, where she was inducted into the Alpha Omega Alpha medical honor society, her residency at the University of California-San Francisco, and her postdoctoral fellowship at Stanford. Her interests include patient engagement and shared decision-making. Lucy Kalanithi wrote the epilogue to When Breath Becomes Air by her late husband Paul Kalanithi. Paul Kalanithi is currently considered a "single author." If one or more works are by a distinct, homonymous authors, go ahead and split the author. Paul Kalanithi is composed of 5 names. You can examine and separate out names.